The other night I didn’t feel much like cooking, but didn’t want to spend money on take-aways either. I also had some chicken in the fridge that had thawed that needed to be used. What I thought would end up as a slap-together quick dinner, ended up being really yummy, so I decided to share it with you. Heat oven on ‘high’ grill/broil. Cut chicken breasts into 2cm thick slices and fry in a little butter. Sprinkle on garlic salt while cooking. Meanwhile, spread however many slices of good bread you think you’ll need with butter. In another pan sauté some an onion sliced in rings. When they are soft, sprinkle a large pinch of sugar over the onions to caramelise them while cooking a little longer. 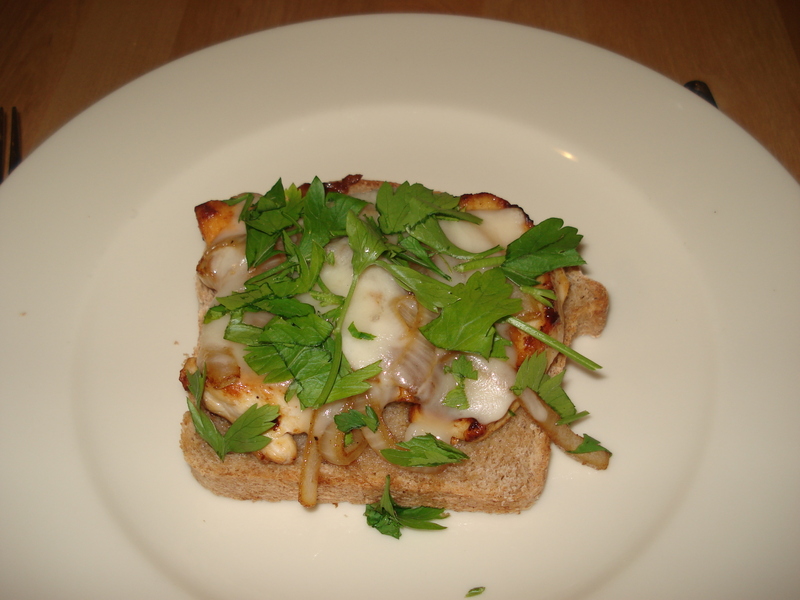 Top the bread with the cooked chicken and onions and put some sliced cheese on top. Whatever cheese you have on hand will do fine, but preferably not a sharp cheese — something mellow like swiss or colby or edam will work well. Place under the grill/broiler until the cheese is melted. Sprinkle some chopped parsley over top and serve with a salad. Yum! Great. I’m definitely going to try this! Thanks Franci! Wish I read this last night when we wanted something light. but not take- aways. B.t.w. I tried that Aussie Chicken two nights after you posted the recipe. I, too, made it for the first time on a guest. But since you said it cannot fail, I didn’t worry about the outcome. And we loved it! It’s safely in that handy recipe book which you made for me. Keep sharing great recipes please. You’re so capable in the kitchen! I’m trying this tonight – it looks like a quick and easy (and yummy!) Sunday evening dinner!